YA readers are gobbling up fairy tale retellings. The Lunar Chronicles, Cruel Beauty, Entwined and there's a whole host of new retellings releasing next year. Why do we love them so much? I think it's a combination of nostalgia for childhood stories (and Disney movies) and a love of magic and happy endings. Though I'm a little picky about which ones I pick up, I'm always on the lookout for more fairy tale retellings. 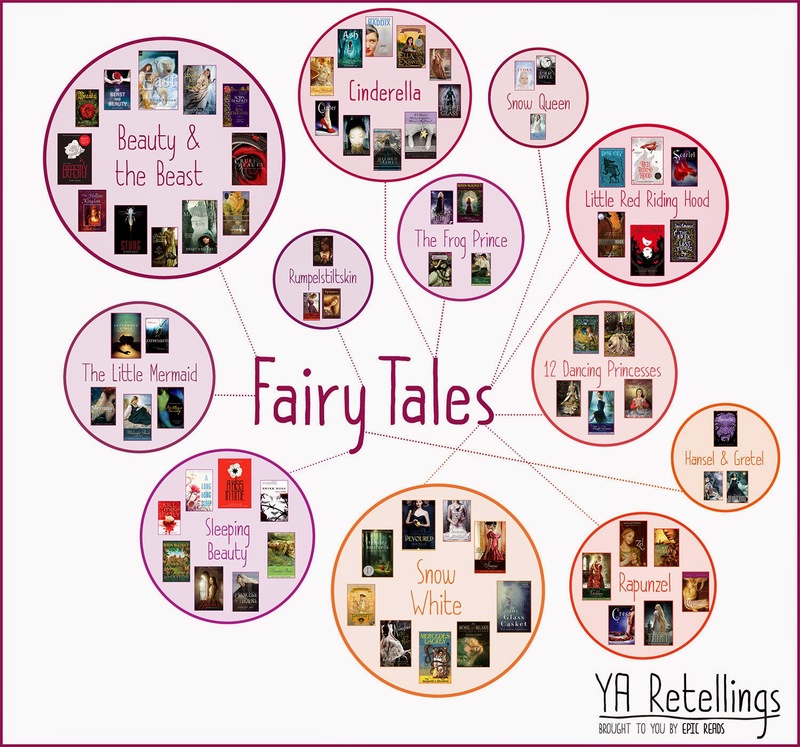 I recently found this amazing "Epic Chart of 162 Young Adult Retellings" over at Epic Reads, including 74 fairy tale retellings. I mean, check out the above chart! Is that not awesome? So, if you're like me and looking for your next fairy tale retelling, Epic Reads' chart is a great place to start. It also has listings for Mythology, Shakespeare, and Classics retellings, which I highly recommend checking out as well. What do you think? Do you like fairy tale retellings? Avoid them like the plague? Don't care? Or maybe you prefer the mythology or classics retellings? Do you have any favorites? Hmm, sometimes? I liked Peter and Max but read it a few years ago. LOVE Snow, Apples, Glass by Neil Gaiman and Six-Gun Snow White by Valente. But it isn't a group of books I tend to seek out, I know I have read a couple of stinkers (and seen some bad, bad movies). Ooh, I haven't read any of those, but they sound interesting. Any chance you were thinking of the 1980's made-for-TV fairy tales (e.g., Rebecca De Mornay's "Beauty and the Beast," which is hilarious), or perhaps the more recent "Snow White & the Huntsman"? I love retellings - fairy tale, classic, mythological. Just retellings in general. It's so much fun to see how someone else might write a familiar story; how they would change it, what new twist they'll put on it. I've read good retellings - mostly, thank God - and some pretty horrid ones, too. But it's always fun. Whenever people say they've read good and horrible retellings, I immediately want to know what the horrible ones were. Is that bad? No; it's natural instinct so you know to avoid them (or whether or not that person has good taste, because they may hate one you loved!). ;) Horrible may not be the right word; disappointing, and not as good as the hype claimed. Alex Flinn's retellings are the ones that come to mind the most for me. I like them, but they're not the best. Oh wow that really is a cool chart! I hope they keep it updated LOL I do enjoy a good fairy tale retelling though I prefer when they find a unique new name for the character instead of using the ones everyone seems to use. Me too! I finally created a retelling shelf on Goodreads, but there are so many others out there. The unique names are cool, though I don't mind a well used name if the character rocks (e.g., Linh Cinder). Totally checking out your Goodreads shelf. I've been 'burned' by some fairy tale retelling attempts. So even though I am totally interested in reading some more, I'm kind of intimated to try! I think also it's easy to love retellings when you love the fairy tale itself. It gives you the chance to experience what you love but discover it too. Like a new episode of a tv show you love. Sorry if this posts twice, but I was just trying to post and my computer went crazy. I basically said that I love all things fairy tale related. I've seen and read many versions, some good, some bad and some really funny. I especially love Neil Gaiman's Snow Glass Apples, as well as his most recent ones which include Hansel and Gretel, as well as The Sleeper and the Spindle. As for the 80's movies that someone commented on here...I too saw the Rebecca De Mornay version of Beauty and the Beast and thought it was hilarious, but the Puss in Boots with Christopher Walken beats it in hilarity, plus he sings in it. I would recommend you check out the Bloody Chamber and Other Stories by Angelo Carter and also the previously mentioned ones by Neil Gaiman. I must be living under a rock because I never seem to see these Gaiman retellings. I'll have to keep a special eye out for them next time I hit the bookstore.